I started with a new tablecloth from Home Goods. I like the fact that it has some sparkle in it! 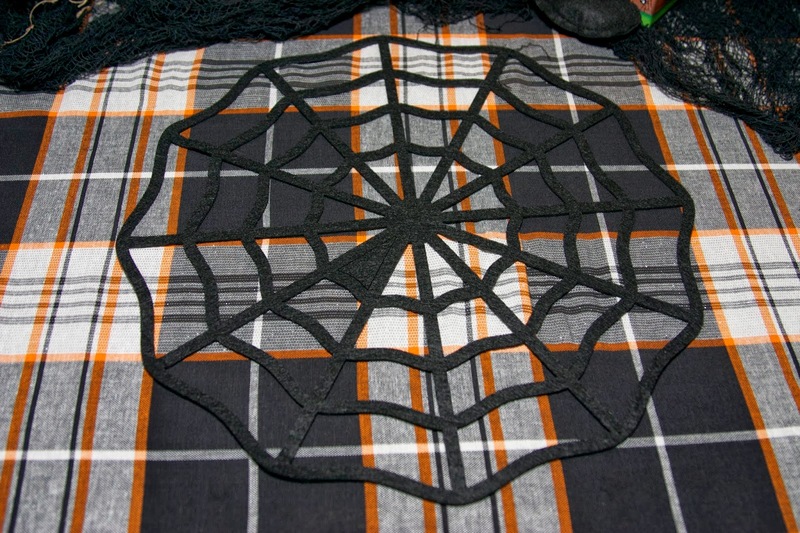 I then added a spider web placement from Dollar Tree. I found these orange plates at a local pharmacy (RiteAid)! 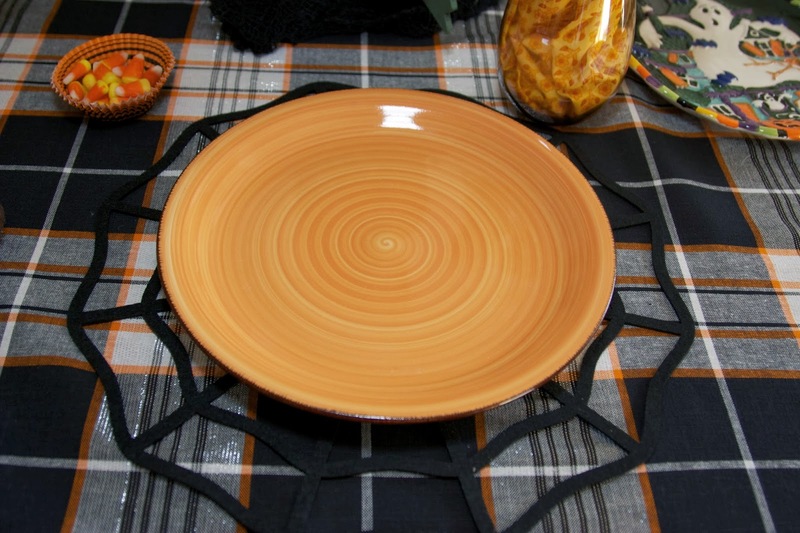 They are marked RiteAid Home Design, Stoneware Dinner Plate. 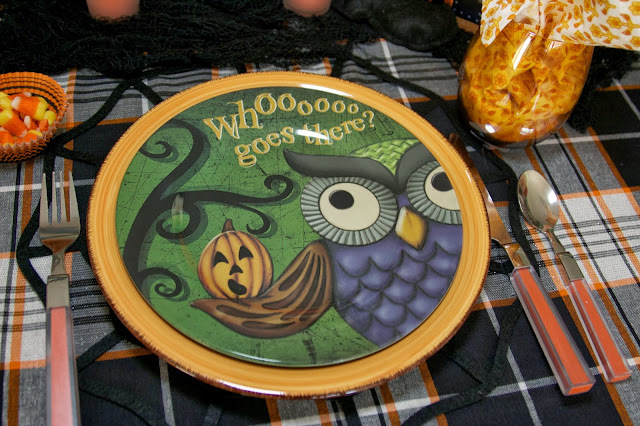 These Halloween plates are melamine and they have different pictures on them and were found at a Design Center. 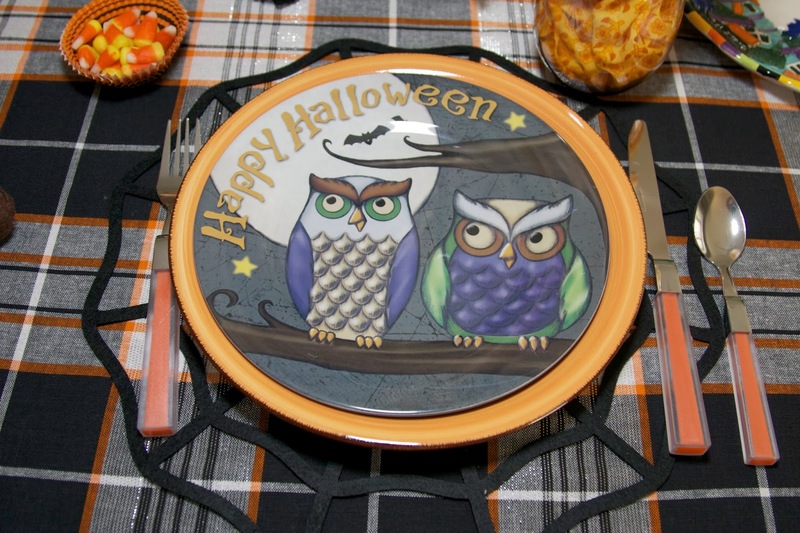 Once, again, I am surprised at how popular owls have become this year. 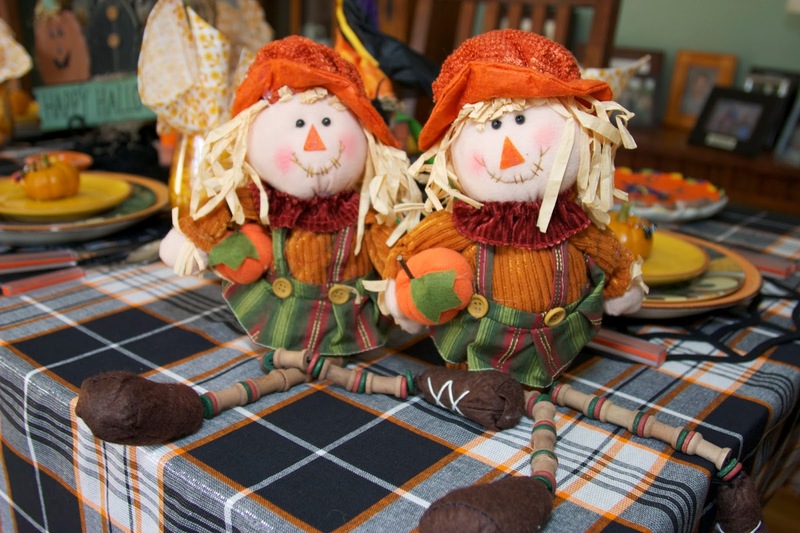 I liked the fact that they're kind of cute, not scary and creepy like so many Halloween decorations have become. 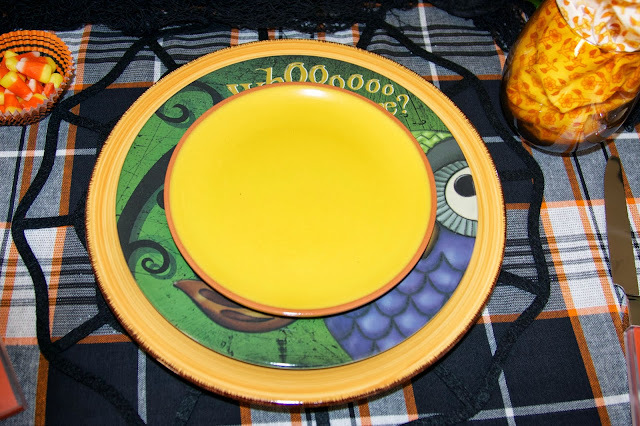 The stack continues with some appetizer plates from Portugal I found at Pier One. They are from their SUL collection. 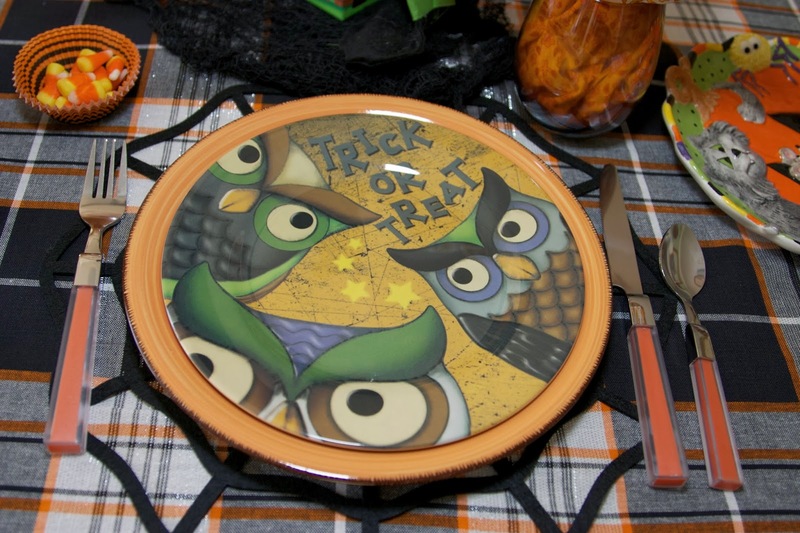 My flatware came from Target and was a great buy at their end of summer clearance sale ($1.98 for each place setting!). I brought out my amber stemless glasses from Pier One and was glad to see my napkins from there reminded me of candy corn and would work in this setting. 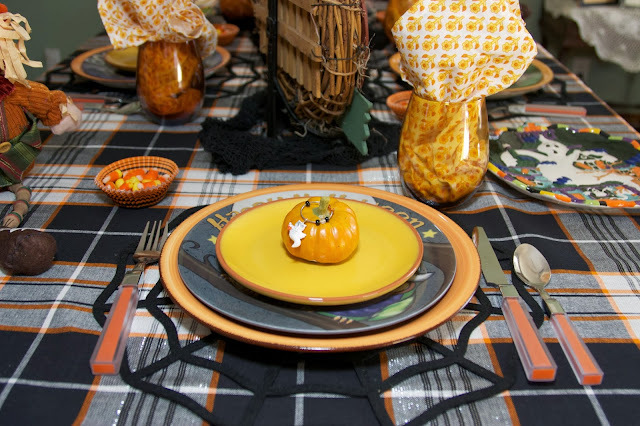 Some cupcake holders full of candy corn finish the place setting. This Halloween wreath has been in my decorating bin for years, and usually hangs on my front gate. 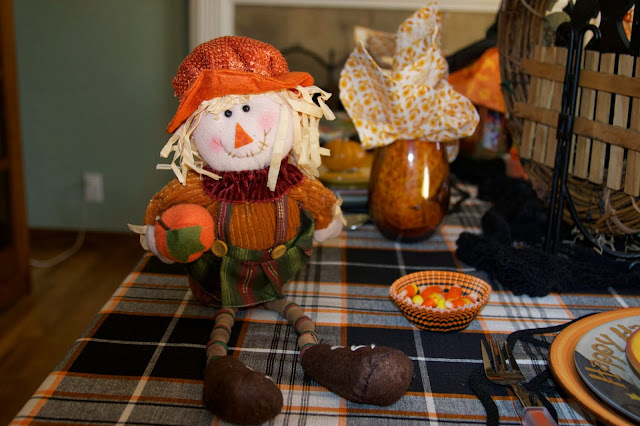 I hadn't hung it up yet and thought, "...um....maybe it would work on the table!" And it did! 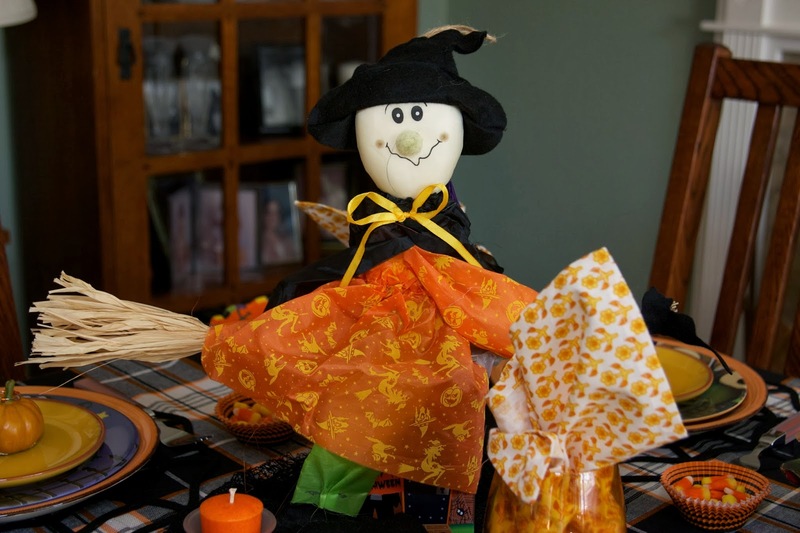 I found the witch at Dollar Tree, and couldn't resist the cute expression on her face. She's not going to scare anyone; she's just looking for a good ride through the night air, and maybe sneaking a treat or two! 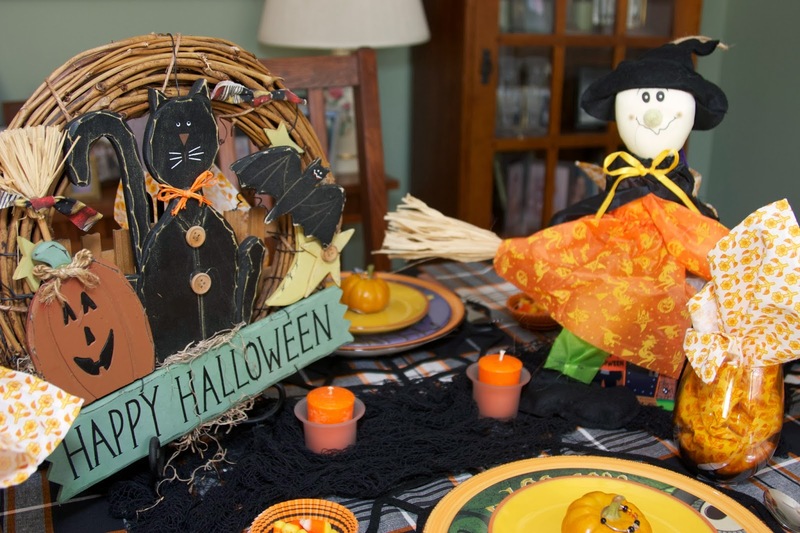 Black gauze and orange candles finish the centerpiece. These two scarecrow dolls from another pharmacy (CVS) normally sit on my bookcase, but I thought they'd enjoy joining the party! 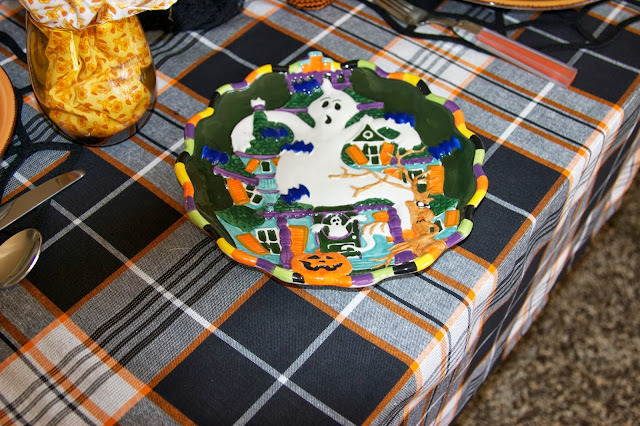 These accent plates were from JC Penney's Homestore and have been part of my fall decorations for years. 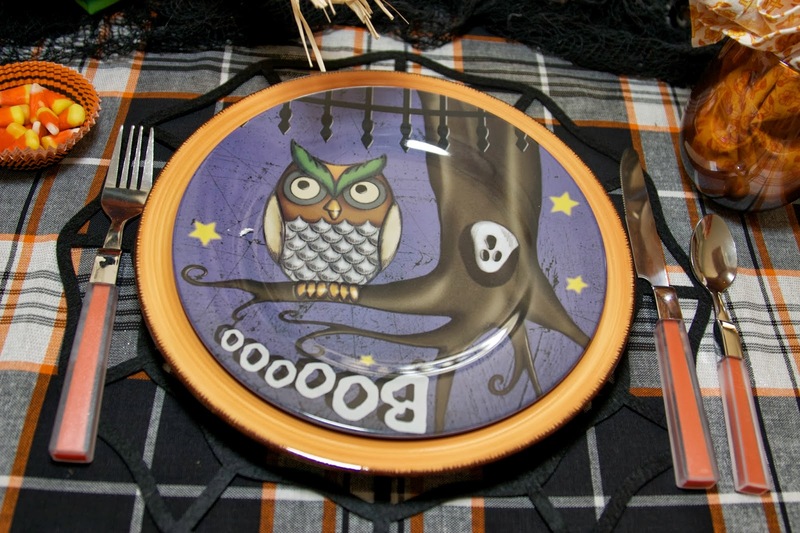 So, that is my first Halloween tablescape. I do like the colors together. There is something quite striking about black, orange and white. I think I'll dig out that old "Haunted Mansion" soundtrack and set up the CD player by the front door! HAPPY HALLOWEEN, EVERYONE!!!! If you'd like to be a follower and get email notifications of new posts please see the top of this blog and enter your email address where indicated under "Follow by Email". I LOVE that I can see what you are doing from 3,000 miles away. Everything you have put up so far are fantastic!! Wish I had the time to do this, but I will live through you!!! These all look so fantastic! Thank you for checking out my blog, Patty. It's such a fun hobby! I miss you, too, and will be calling soon. 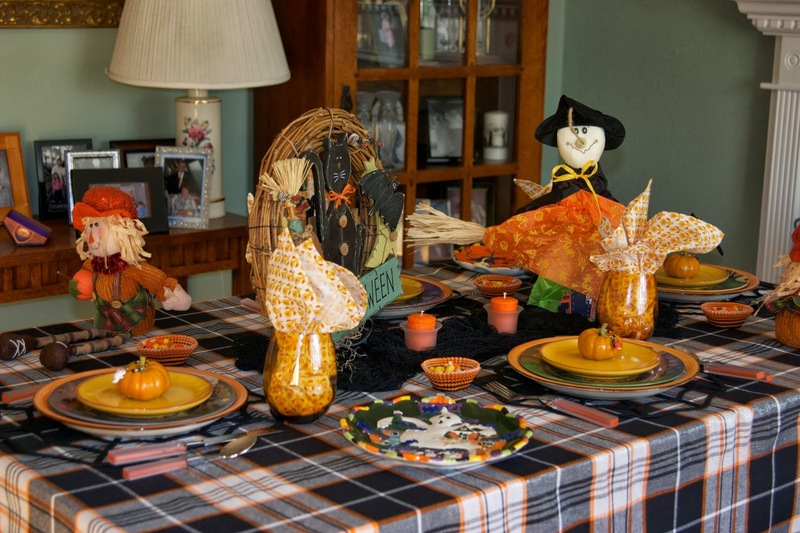 You did a Beautiful job on your first Tablescape of Halloween with all the dishes and decorations. 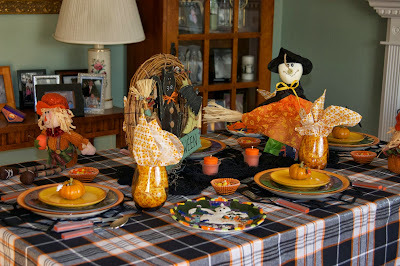 I hope to see more from you keep up with your great Ideas, hoping you have a wonderful weekend with your family also, and thanks so much for your sweet comments on my Tablescape for two. 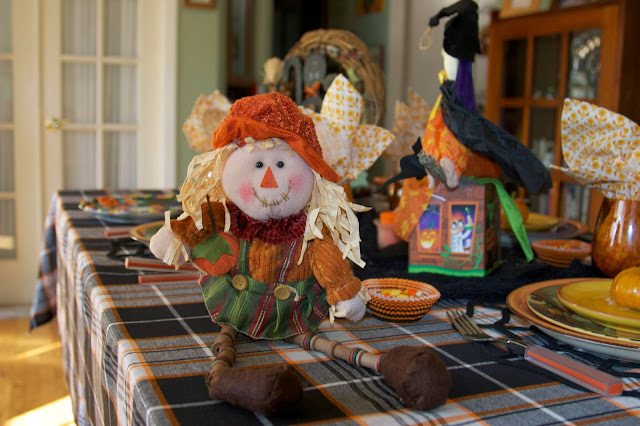 Rosie, I think you are "pulling my leg" - you look like a pro with this tablescape!! Your tablecloth is just perfect and all of your cute dishes and accessories are adorable. 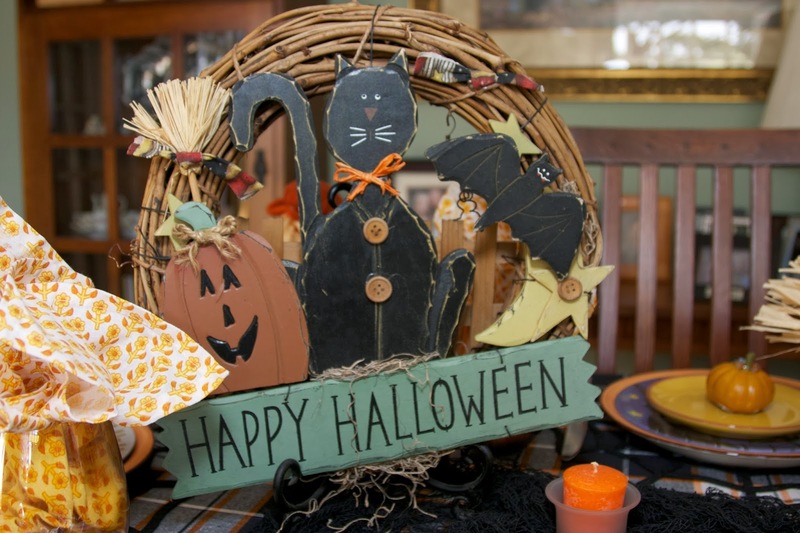 it was brilliant to use the sign in your centerpiece. Love everything! 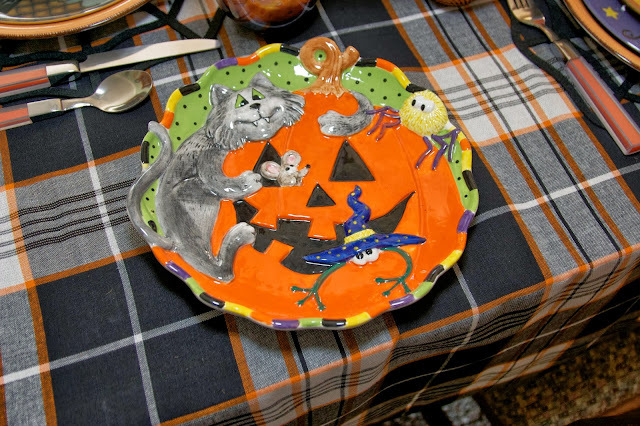 I love your tablescspe and am amazed it is your first! Everything is great. I am going to check out Rite Aid and CVS!!!! I am trying to remember where I got the witches shoes candle holders and will let you know!